Join Porter Square Books and the Parent-Child Home Program for a presentation by childrens book author and illustrator Scott Magoon. Scott will present ten common characteristics of excellent picture books, showing examples of each. This presentation will be useful to parents and educators looking to select quality picture books for their children and students. The Parent-Child Home Program helps families challenged by poverty, limited education, language and literacy barriers, and other obstacles to school success prepare their children to enter school ready to be in the classroom. Scott Magoon is the illustrator of many books for young readers, including Big Mean Mike by Michelle Knudsen; Kara LaReau’s Rabbit and Squirrel and Ugly Fish, which was a CCBC Blue Ribbon winner; The Luck of the Loch Ness Monster by Alice Flaherty, which was named to the 2009-2010 Texas Bluebonnet Award Master List; Otto Grows Down by Michael Sussman; and Spoon by Amy Krouse Rosenthal. He is also both the author and illustrator of Hugo & Miles; I’ve Painted Everything; and Mystery Ride. The art director at a major children’s publisher, he lives in the Boston area with his wife and two sons. A laugh-out-loud funny story about not worrying what others think — even if you’re big and tough, and your friends are fuzzy and cute. Big Mean Mike is the biggest, toughest dog in the whole neighborhood. He has a big, mean car that he likes to drive around the big, mean streets. Everyone knows that Mike is big and mean, and that’s just the way he likes it. But one day a tiny, fuzzy bunny shows up in his car. Mike can’t believe it! Before anyone can see, he puts the bunny down on the sidewalk and drives away. When the tiny, fuzzy bunny shows up again — and this time brings a friend — Mike tells them both to get lost. Big mean dogs do not hang out with tiny, fuzzy bunnies! But gosh, those bunnies sure are cute. . . . From best-selling author Michelle Knudsen and illustrator Scott Magoon comes a comical lesson about how keeping up your image is not nearly as fun as being your own quirky self. Saturday, January 26, 11:00 AM Saturday Story Time: Michelle Knudsen presents Big Mean Mike Michelle Knudsen read her book Library Lion at Greenlight’s very first story time back in 2009 – and now she’s back with another Greenlight favorite, Big Mean Mike! Everyone knows that Big Mean Mike is the biggest, toughest dog in the whole neighborhood, and that’s the way he likes it. He has a big, mean car that he likes to drive around the big, mean streets. But one day a tiny, fuzzy bunny shows up in Mike’s car. Big mean dogs do not hang out with tiny, fuzzy bunnies! But gosh, those bunnies sure are cute – and they like monster truck shows… Michelle’s book is about how keeping up your image is not nearly as fun as being your own quirky self, and is sure to delight kids and parents alike. Join us for story time with one of our favorite Brooklyn authors! Ages 3 to 8. Michelle Knudsen signs Library Lion and The Dragon of Trelian. THE DRAGON OF TRELIAN LAUNCH PARTY! MICHELLE KNUDSEN reads from THE DRAGON OF TRELIAN. Michelle Knudsen is a LibraryThing Author, an author who lists their personal library on LibraryThing. Michelle Knudsen's book Curse of the Evil Librarian is currently available from LibraryThing Early Reviewers. Michelle Knudsen's book Revenge of the Evil Librarian was available from LibraryThing Early Reviewers. Michelle Knudsen's book Evil Librarian was available from LibraryThing Early Reviewers. Michelle Knudsen's book The Dragon of Trelian was available from LibraryThing Early Reviewers. 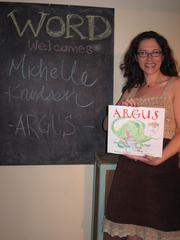 Michelle Knudsen is currently considered a "single author." If one or more works are by a distinct, homonymous authors, go ahead and split the author. Michelle Knudsen is composed of 5 names. You can examine and separate out names.